(Utah Interagency Fire) — The State of Utah is experiencing high temperatures, low humidity, and high fire danger. The Great Basin Coordination Center’s Predictive Services indicates these conditions will extend throughout the next several weeks and likely into the fall. Because of this and since there has been an unusually high number of human-caused fires throughout the state and precipitation has totaled less than .5” in the last 30 days, fire restrictions will be enacted in additional locations. No campfires, except in permanently constructed cement or metal fire pits provided in developed campgrounds and picnic areas or homes with running water available. No smoking, except within an enclosed vehicle or building, a developed recreation site or while stopped in an area that is paved, barren or cleared to mineral soil. In addition, metal cutting, welding, and grinding activities in areas of dry vegetation as well as discharging, or using any kind of fireworks, firing steel tipped/core ammunition, tracer ammunition or other pyrotechnic devices including exploding targets are prohibited on BLM and State/Private Unincorporated lands. 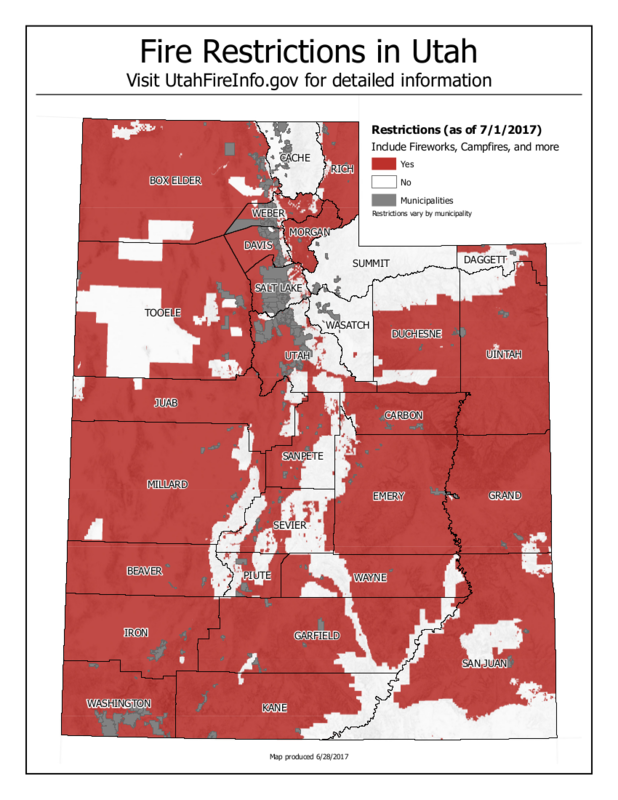 These restrictions do not apply to the Manti-La Sal and Ashley National Forest Service lands or lands within incorporated towns and cities; however, each municipality may have similar or more restrictive ordinances. Questions about specific areas should be directed to local authorities. For more information about fire restrictions, wildfires, fire prevention, and fuels treatment projects, please visit www.utahfireinfo.gov.